Language is a complex network of interconnected words, like grooves guiding sentences. Deeply-etched language grooves are easy to say or write, reinforcing common perceptions and misconceptions. Labels help to identify common themes, interests and categories of people, guiding us to appropriate responses and to like-minded communities. But we should always see the person before the label. Different word choices can centre or remove the person in a narrative – ‘autism’ is a noun and a subject in its own right, whereas ‘autistic’ is an adjective demanding a noun – a child, son, partner or other human subject. A word diagram contrasting how Irish newspapers write about ‘autism’ (and possibly, but often not, person-first use), with how they write about ‘autistic’ subjects (and almost always identity-first language). It is easy to omit and forget the person when writing about ‘autism’. Language is full of familiar patterns that are much easier to write or to say because they are widely used, often without much conscious thought about exact word choice. Familiar patterns of word use shape how we feel about a word – we talk about suffering from autism, or autism in a classroom. It is easy to forget to include the human subject in a conversation about autism traits, autism parenting or autism interventions. The words (nodes) are sized in proportion to word frequency, selecting the most frequent words used in newspaper articles that include ‘autism’ and newspaper articles that include ‘autistic’. The words are connected by a line (directed edge) with a width proportional to the co-occurrence of the pair of words (in the direction of the arrow) – displaying phrases about autism, from left-to-right. The words and lines are coloured according to whether they occur more often with ‘autism’ or with ‘autistic’. 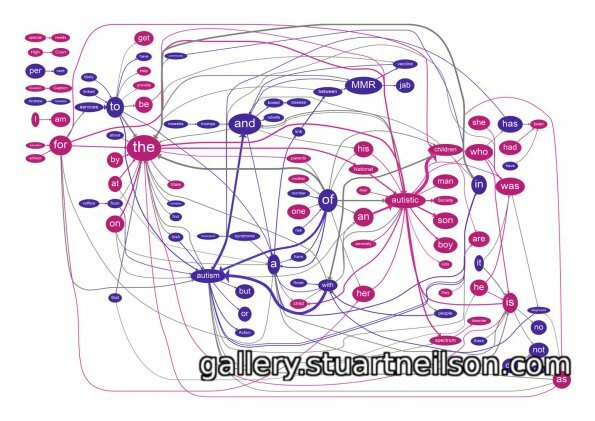 I use Graphviz to assemble word bigrams into networks representing frequent word usage and Bigram and Ngram analysis to generate word usage patterns. These widely published statistical techniques are fundamental to many modern internet processes using natural language as input, including internet (e.g. Google PageRank) search engines and automatic language translation. St Gobnait, Patron Saint of Beekeepers. 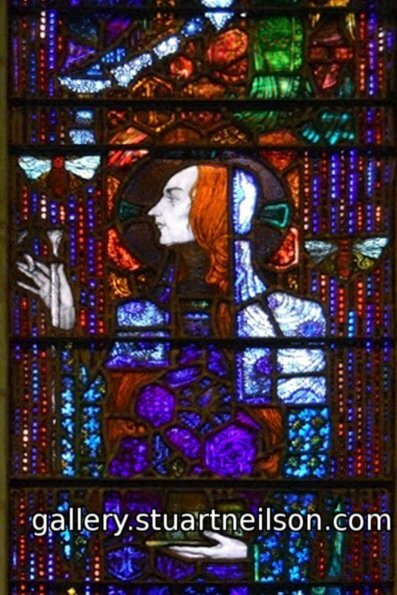 (Stained glass by Harry Clarke in the Honan Chapel, UCC). Pilgrim’s signs of the cross – three times each, in three places, nine signs of the cross for nine white deer. The pillars allow pilgrims to continue the ritual while protecting the older structures. Pilgrim’s signs of the cross on St Gobnait’s grave, Ballyvourney. After 500 years, a pilgrim follows the groove laid down by their predecessors, repeating the ritual. It is hard to make a mark outside the lines. Headstone in St Michael’s Church, Blackrock. 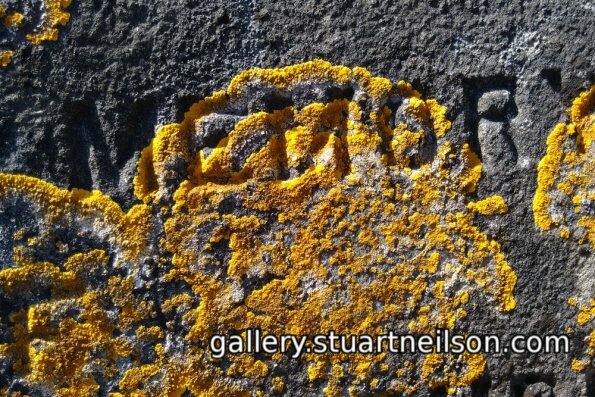 The lichen grows at about 1.2 mm per year, and these layers of lichen remember a few decades in the graveyard. 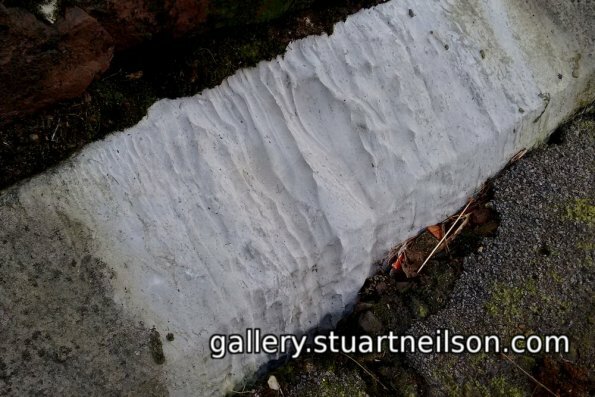 Limestone eroded by a water drops from a broken water chute, Lower Glanmire Road. 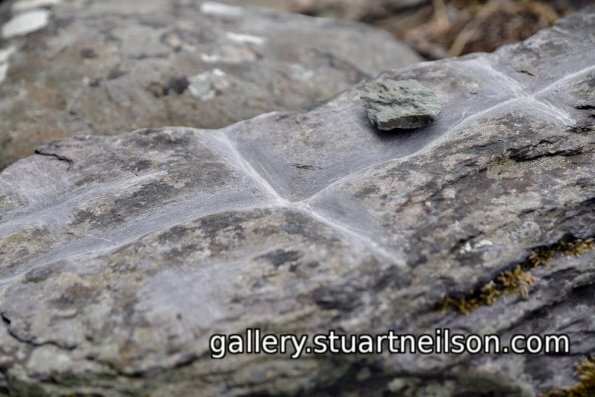 The material has its own form and resistance, the erosion marking both the path of water and the rock’s rebellion. 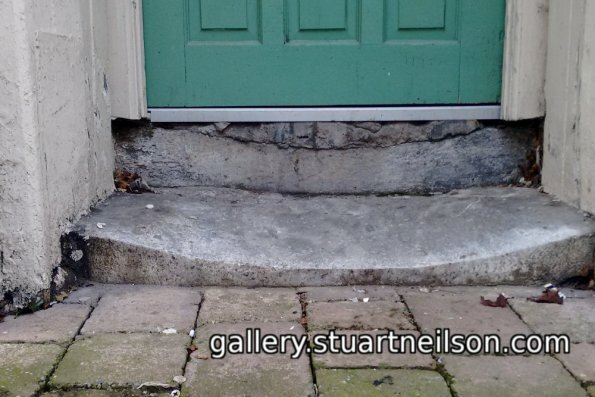 Threshold, St Anne’s Shandon. 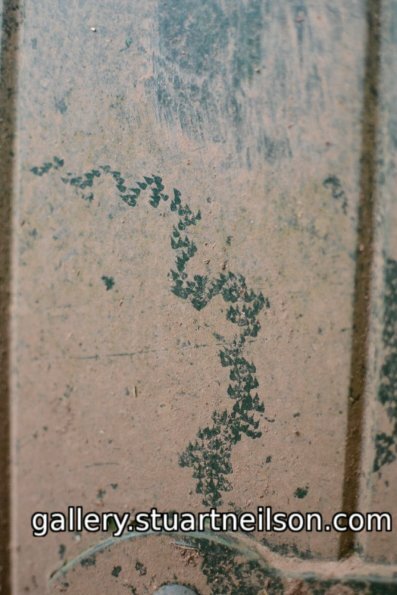 The passage of many feet has worn a perfect Normal Distribution in limestone. We usually forget that Normal is a distribution, from edge-to-edge and not the deepest centre of the curve. Those of us who held onto the wall are as much a part of Normal as those who skipped up the middle. A perfect circle, from the right pespective. 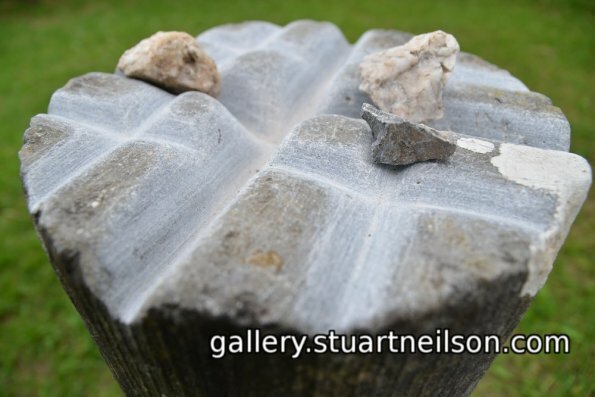 Blast drill holes at the roadside, Gougane Barra. Autism tends to be understood either as a medical disease or a social condition. The language used within, and the language appropriate to, these two groups is very different. Films and fiction (especially fiction written by people without direct experience of autism) often import inappropriate textbook terminology and diagnostic criteria directly into social situations, in search of accuracy or authenticity. There is no ‘correct’ language for all contexts, but using language with care is a choice to include autistic people in society, and a choice to respect individuality and autonomy. 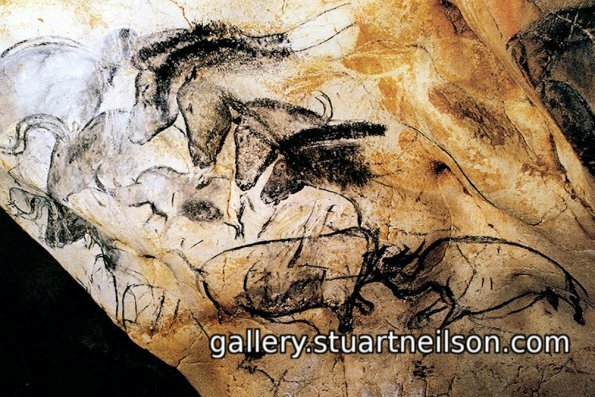 Horses and other animals, sketched in multiple overlays around 32,000 years ago in Chauvet Cave, France. Perhaps it was ritual repetition, perhaps an attempt to capture the liveliness of the animal – they are beautifully animated when lit by a flickering flame. TV nature documentary on animals at the water hole, change-mapped and outlined. 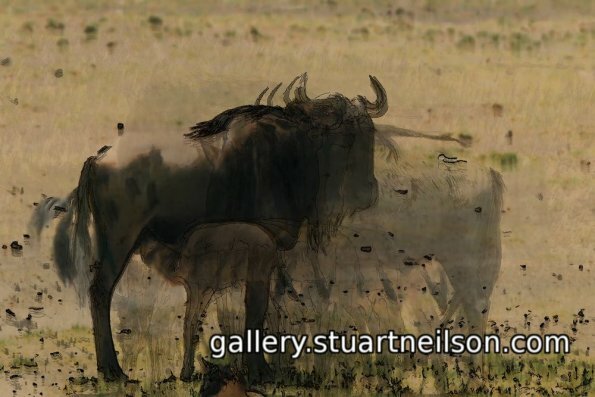 The images capture, for me, a sense of the animals’ paths and motion. 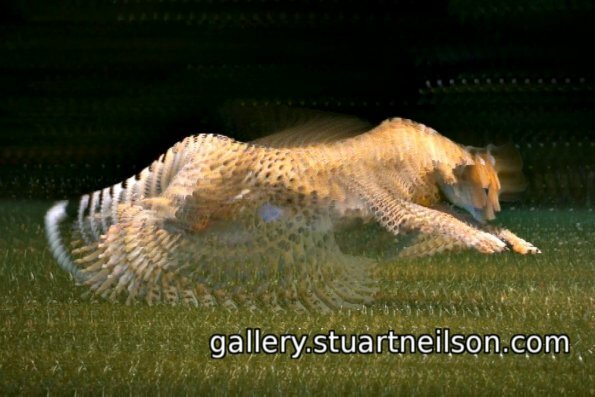 TV documentary on the fastest land animal on Earth, change-mapped and outlined to show the wonder of the cheetah’s pace. Autistic people inhabit a zone between medical and social understanding, simultaneously perceived by their medical needs and their social needs. Autistic people are rarely consulted about their own portrayal. Autistic interests, objectives and priorities rarely feature in public perception, and we rarely see the world as perceived by autistic people. 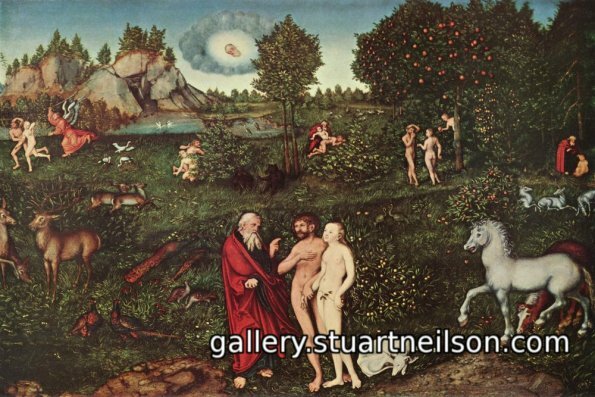 Adam and Eve from their creation (left and centre), through their privileges and obligations, to their departure (top-right, chased out by Jophiel with a pitchfork). Painting by Lucas Cranach the Elder, 1535. 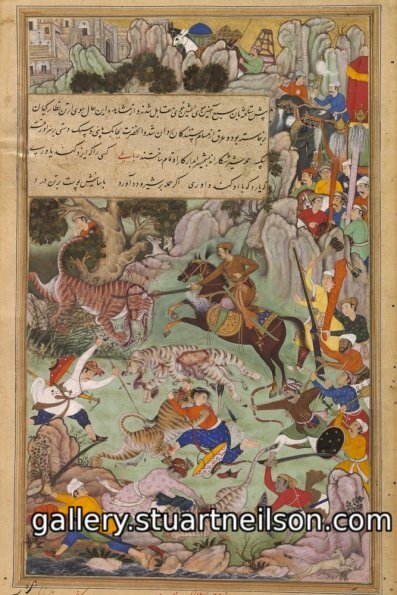 A tiger hunt from preparation (top), through ambush (centre) and chaotic end (bottom). From the Akbarnama (book of Emperor Akbar), circa 1590. A snail’s night-time path, grazing with its radula (teeth) as it moves forward and swings its head from left-to-right. The path diminishes as its belly fills. Fota Arboretum. 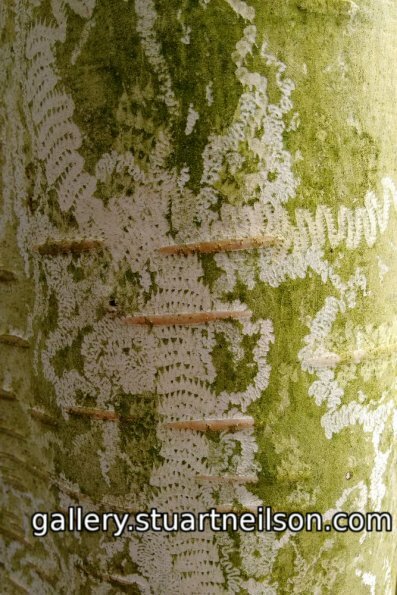 Snail feeding paths on silver birch, Presdent’s Garden, UCC. 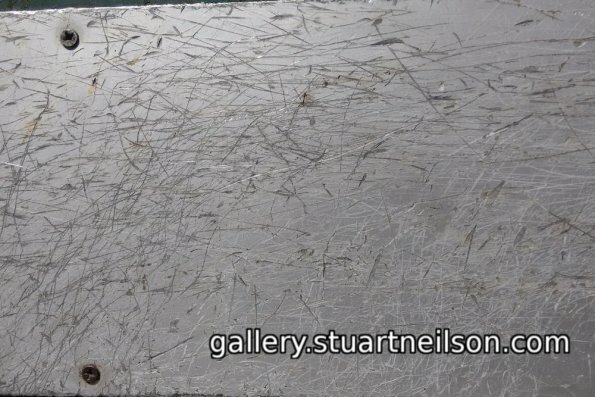 An aluminium kick-plate on a service door at the rear of Merchant’s Quay, and an image of the paths that employees and shop staff take with their hands full. 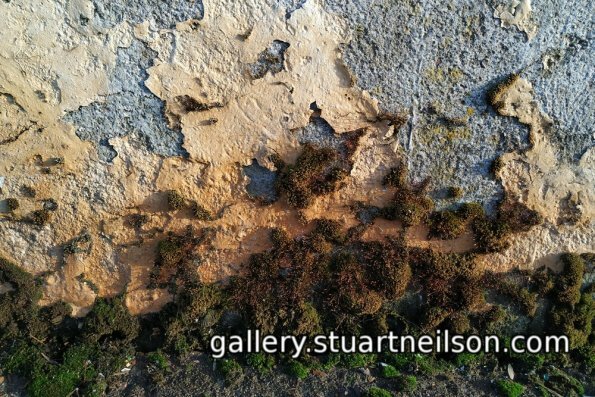 A landscape of moss on peeling paint at the edge of a pavement, Monaghan. 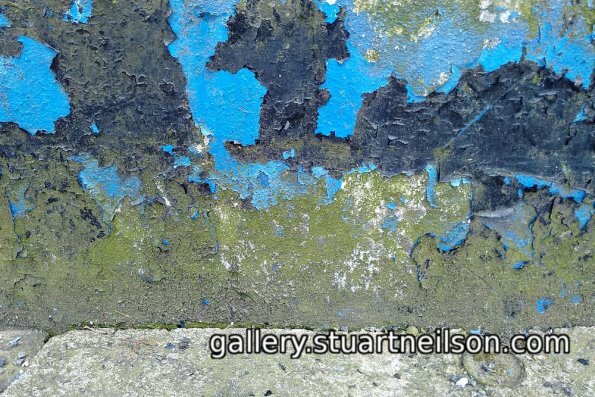 A landscape of peeling paint, Beasly Street. Consciously ‘changing groove’ has a dramatic impact on language, leaving behind many of the perceptions and mis-conceptions of one language pattern in favour of another. 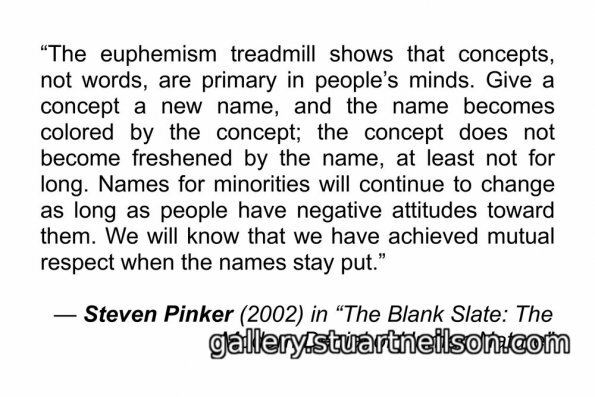 “Reclaiming the metaphor”, using existing familiar language in new ways, may be easier than creating unfamiliar new terms. Choosing respectful, empowering images that accurately reflect autistic people may ultimately liberate us from the ‘euphemism treadmill’. I am a statistician, mathematician and computer programmer, so I have used the tools I know to make the images I want to share. All the techniques I have used are published methods and all the software is Free and Open Source Software (meaning you can download and run the same code, with a little technical expertise). These computer tools give me a sense of objectivity, because I feel that I am using a machine that repeatably generates the same output over and over, whoever was operating it. 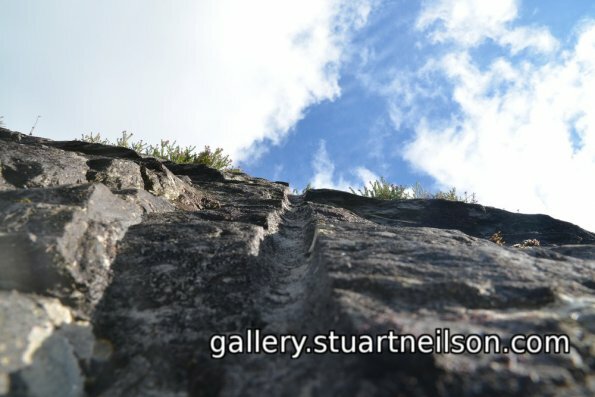 I am aware that my sense of objectivity is false, and these images are subjective and personal – just as the word ‘autism’ conveys a sense of scientific objectivity, disguising the equally subjective, diverse reality of autistic experience.